Everyone's favorite belligerent badass is going back to his roots for a Steam re-release. Ok, so Duke Nukem Forever turned out to be less than stellar, but let's not forget how much fun the franchise's earlier titles were. A small studio call Devolver Digital certainly seems to remember Duke's glory days, and the company is now teasing a new, Steam-compatible version of the original Duke Nukem 3D, complete with some unspecified new features. The developer's official Twitter account teased the reveal, noting that it's a "side project" that the company is currently involved in. 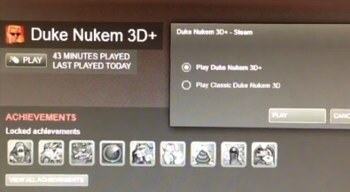 A short video clip accompanied the announcement, showing some gameplay from Duke Nukem 3D, along with a short glimpse at the game's Steam page, complete with achievement icons. "It's got some new bells and whistles plus full Steamworks support," Devolver tweeted after the reveal. "More on that later though." No further information has been divulged, but just knowing that a classic Duke Nukem re-release is in the works should be enough to make veteran PC gamers all nostalgic with glee.